On November 5th, Pacific Ridge hosted an evening of connection and conversation for students and faculty from Pacific Ridge, Francis Parker, The Bishop's School, and La Jolla Country Day who will be attending this year's National Association of Independent Schools Student Diversity Leadership Conference (SDLC) in Tampa, Florida. The December conference is a multiracial and multicultural gathering of upper school students from around the country with a goal of building community and promoting social justice. 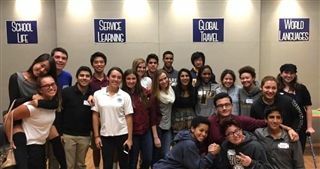 By meeting before the conference and building relationships, the San Diego students hope to increase the impact of the experience on themselves and their schools.